Sourced through the Compression Institute. Michel Baudin‘s comments: While I agree with Doc Hall that there is more to life in society than manufacturing or even business operations and that we need to continuously rethink the conclusions we have reached on “ourselves, our human economy, and of the natural world,” I don’t see much value in putting all of these deep meditations under Lean, which I see as nothing but a convenient label to enable car companies to adopt Toyota’s system without referencing a competitor, and to allow organizations outside the car industry to borrow and adapt concepts from this system. In health care, for example, running hospitals based on concepts from car making is not attractive to doctors, nurses, patients, or any other stakeholders and therefore, where these concepts are relevant, they must be carefully packaged to avoid attracting attention to where they came from. “Lean” caught on but, after 25 years of bandwagon jumpers selling unrelated ideas under this label, it has lost much of its meaning and of its luster. Discussions of business values and of the proper strategy to use the resources freed up by productivity increases are valuable and necessary, it is only connected to Lean within the context of the management of a company, not in society at large. To increase productivity in a company, you need to engage the work force but you cannot do it for long if success leads to layoffs. Continuous improvement, in the sense of improvement pursued all the time, is only possible if it results in pulling the best people from their current jobs into more challenging and rewarding roles. By instead systematically firing the ones with the lowest scores, as in Jack Welch’s rank-and-yank approach, you could demotivate an anthill. Long-term success in manufacturing as well as in many other business activities goes to companies that retain the talent they grow. They don’t reduce their labor costs by laying off employees, but by producing more with the ones they have. As a consequence, even though their contributions to the economy grows, their share of the labor force shrinks. This is how the US manufacturing sector went from 40% of the work force in 1960 to 11% today, and offers no reason to think that it will not shrink further. And before mourning the loss of “good manufacturing jobs,” we should not forget that most of the lost jobs were dull, dirty, and dangerous, and that the jobs that remain in this sector require different skills, such as programming and maintaining machines and systems, versus manually handling and processing workpieces. 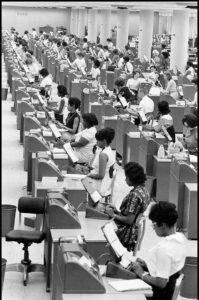 In offices, the typist jobs eliminated in the 1980s by word processing were dull, and the typing pools have inspired no nostalgia. This is creative destruction at work, with Lean an enabler. What society needs to do about it is a topic that I see as outside the realm of Lean. It is an economic and social policy issue that we need to address as citizens, not as professionals. There is never a shortage of unmet needs, ranging, in the US, from a rickety infrastructure to mediocre schools and a health care system that delivers a lower life expectancy than Bosnia. We have better things for human beings to do than drive trucks or fasten bolts on an assembly line but how do we make the transition? How do we, as a society, organize to make sure that the human talent freed up by increases in productivity is put to use where it does the most good? The “creative” part of creative destruction, so far, has always created more jobs than it eliminated, but it doesn’t mean that those who lose their jobs are ready to take on the new ones. Furthermore, at the current pace, the jobs created today are the ones destroyed tomorrow, and anyone entering the work force today can expect to retool for a new profession more than once. No government intervention. Some believe that no government action is required at all and that the invisible hand of the market can be relied upon to create new options for individuals who lose careers a result of creative destruction. Sometimes, it works. For example, the estimated 1 million typing jobs lost in the 1980s in the US did not cause unemployment to spike, even though no massive government retraining program for typists was ever implemented. For coal miners, on the other hand, it has not worked out so well. Government intervention to preserve existing jobs. In other cases, governments have fought rearguard actions to slow down or prevent creative destruction, through direct subsidies or protectionism. Into the 1930s, the French government subsidized the use of sail freighters to preserve sailor jobs; today, is doing its utmost to protect neighborhood bookstores and slow down the adoption of ebooks. Government support of new technology. Governments also try to be on the vanguard by supporting the development of advanced technology to create new jobs, but it requires them to know what to support. Historically, they have made many mistakes. In the 1950s, the Soviet government bet on analog computers; in the 1980s, the Japanese government on “fifth-generation computers” that didn’t materialize. But there are also cases of governments making the right calls, like the US government with interchangeable parts technology in the 19th century and with the internet in the 20th. Through its state-owned company, the French government also supported the Minitel in the 1980s, a successful precursor to the worldwide web. Today, the German government has an Industry 4.0 program on manufacturing, and we’ll see how it turns out. Income redistribution and the social safety net. Many economists, and in particular Thomas Piketty, have documented the rise of inequality in advanced economies over the past 35 years, with improvements and innovation benefitting only small minorities, with the corresponding withering of the middle classes crimping economic growth and causing political instability. To Piketty, far from being an invisible hand working for the common good, the market is a wild beast that must be tamed, by tax policies and regulation, using today’s information technology to follow the money worldwide in real time. Bernie Sanders would probably agree. To return to Doc Hall’s points, yes, we need to continuously regenerate ourselves and the immediate environment we control. It’s a matter of individual economic survival, but it isn’t enough. We must also address the issues of society as a whole. It’s our duty as citizens, and it’s a bigger challenge than implementing Lean. Michel, I appreciate your thoughts. If I may share a few of my own. If for a moment we elevate systems thinking at the planetary level, we find a world “in balance.” There are ebbs and flows in climate, seasons, resources, along with migrations of people and wildlife, and so on. So, for the most part, these ebbs and flows have always been around. Now let’s come back down to earth so to speak. I believe it is no less true for businesses, governments, and cultures at large. These entities will progress. Improvement, however you’d like to define it, will happen by various methods over time. But, most of this happens at a zero sum gain – winners and losers. The factors of which are many and too deep of a conversation via blog post. But, my question is – does it have to be this way? Theoretically not. Humanisticly probably so, since we have eons of history to reflect on. On a positive note, Deming said that the height of any “system” is altruistic purpose. Everything flows from that. Personally, as someone who has been involved in transformational change for 30+ years, I buy into it. Furthermore, IMO, it happens to be what we lack the most.